Akuma – always looking for a worthy opponent! Akuma the Fighting God they call him..Akuma the Raging Demon they call him too..and those who fought him can be very glad if they can share their stories about it. 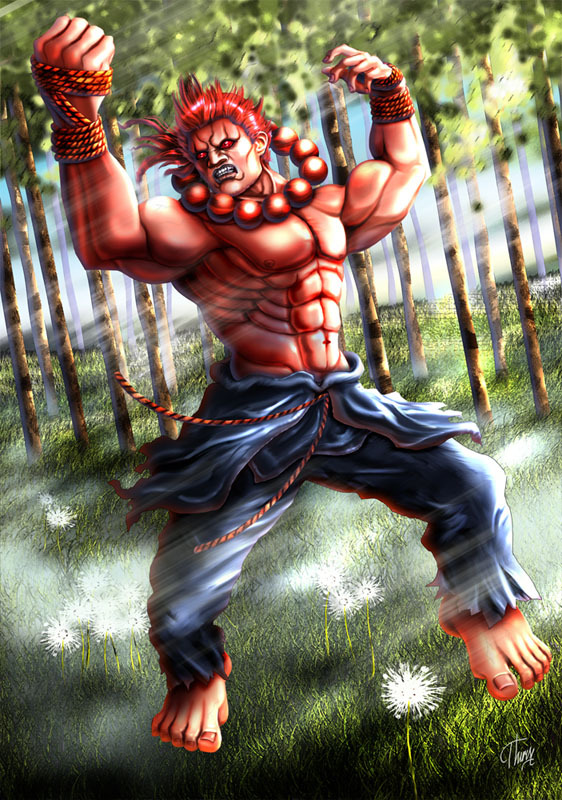 This fan art of Akuma was drawn in Summer 2012 for the “FGE Art Project” The so far only art project by me whichwas not that successful in the end. The idea was that more and more fighting game characters would be drawn for the Fighting Games Elite blog, that the characters would be described there and well..it was too big for a project in general and the interest was relative low. Around 30 pretty cool artworks were created for this project still and well, this is one of them, made by the Norwegian artist Therese Åldstedt. In the end the most of the FGE project submissions are getting featured now on Game Art HQ.